سازه های متشکل از کامپوزیت های الیافی (Fibre Reinforced Composite) نیاز به طراحی ایمن و اقتصادی دارند. تحت بارگذاری پیوسته یا سیکلیک سفتی FRC تنزل می‌یابد، تحلیل متناظر این فرآیند تحلیل آسیب پیش‌رونده نامیده می‌شود که شامل تعیین آغاز آسیب و نحوه ی تکامل آن تا گسیختگی نهایی سازه می شود. معیارهای متعددی برای تعیین آغاز گسیختگی پیشنهاد شده اند. این معیارها اثر قابل‌توجهی بر پاسخ تحلیلی FRC دارند. در این پژوهش ضمن بررسی چگونگی مدل‌سازی آسیب پیش‌رونده در کامپوزیت‌های الیافی، معیار گسیختگی نامتغیرها برای اولین بار به‌صورت المان محدود پیاده-سازی و برای مصالح چندلایه در کنار معیار هشین دو و سه‌بعدی بررسی گردید. از یک زیر برنامه کاربر (UMAT) در نرم-افزار تجاری ABAQUS برای پیاده سازی مدل‌سازی آسیب پیش‌رونده به‌صورت عددی استفاده شد. دوازده نمونه برای بررسی معیارهای مطرح‌شده در دو گروه به‌صورت عددی استفاده شدند و نتایج آن‌ها با نتایج دو نمونه ی مشابه آزمایشگاهی برگرفته از ادبیات مقایسه گردیدند. نمونه های مدل‌سازی شده بر اساس معیار آغاز گسیختگی نامتغیرها توانستند با حداکثر 5% خطا نسبت به نتایج آزمایشگاهی بار نهایی را پیش‌بینی کنند. Fibre reinforced composite (FRC) structures require reliable and economical design. Under monotonic or cyclic loads the stiffness of FRC laminates is reduced. The corresponding analysis is called as the ‘‘progressive failure analysis”. Which includes determining damage initiation and evolution up to structural failures. Several failures criteria of composite laminates have been developed. These criteria have a significant effect on the analytical response of FRC laminates. In this paper a comprehensive review on the general methodologies of the damage constitutive modeling is presented. For the first time, the invariant-based failure criteria for multi-layer materials together with Hashin Two and three-dimensional criteria are implemented and investigated. The analysis is performed by using a constitutive material model (UMAT) developed and implemented in the finite element software ABAQUS. Twelve samples in two groups are used to evaluate failure criteria. The accuracy of numerical results is compared by experimental data taken from literature. The modeling results obtained by using invariant-based failure criteria can predict the experimental data with a maximum error of 5%. Liu, P., Xu, P., Zheng, J., “Artificial immune system for optimal design of composite hydrogen storage vessel“, Computational Materials Science, Vol. 47, No. 1, pp. 261-267, 2009. Zheng, J., Liu, P., “Elasto-plastic stress analysis and burst strength evaluation of Al-carbon fiber/epoxy composite cylindrical laminates“, Computational Materials Science, Vol. 42, No. 3, pp. 453-461, 2008. 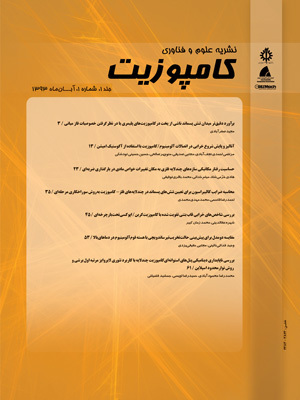 Mohammadi, B. Fazlali, B., “Fatigue life prediction of laminated composites under multiaxial fatigue loading condition by using developed continuum damage mechanics model”, In Persian, Journal of Science and Technology of Composites, Vol. 3, No. 3, pp. 215-224, 2016. Lapczyk, I., Hurtado, J. A., “Progressive damage modeling in fiber-reinforced materials“, Composites Part A: Applied Science and Manufacturing, Vol. 38, No. 11, pp. 2333-2341, 2007. Shokrieh, M. M. Ghajar, M. Salamattalab, M. and Madoliat, R., “Progressive damage modeling of laminated composites by considering simultaneous effects of interlaminar and intralaminar damage mechanisms”, In Persian, Journal of Science and Technology of Composites, Vol. 2, No. 2, pp. 1-8, 2015. Pietropaoli, E., “Progressive Failure Analysis of Composite Structures Using a Constitutive Material Model (USERMAT) Developed and Implemented in ANSYS©“, Applied Composite Materials, Vol. 19, No. 3-4, pp. 657-668, 2012. Bouazza, M., Tounsi, A., Benzair, A., Adda-Bedia, E., “Effect of transverse cracking on stiffness reduction of hygrothermal aged cross-ply laminates“, Materials & design, Vol. 28, No. 4, pp. 1116-1123, 2007. Spottswood, S. M., Palazotto, A. N., “Progressive failure analysis of a composite shell“, Composite structures, Vol. 53, No. 1, pp. 117-131, 2001. Camanho, P. P. Maimí, P. and Dávila, C. G., “Prediction of Size Effects in Notched Laminates Using Continuum Damage Mechanics,” Compos Sci Technol, Vol. 67, No. 13, pp. 2715–2727, 2007. Kachanov, L., “Time of the rupture process under creep conditions“, Isv. Akad. Nauk. SSR. Otd Tekh. Nauk, Vol. 8, pp. 26-31, 1958. Hashin, Z., Rotem, A., “A fatigue failure criterion for fiber reinforced materials“, Journal of composite materials, Vol. 7, No. 4, pp. 448-464, 1973. Czichon, S., Zimmermann, K., Middendorf, P., Vogler, M., Rolfes, R., “Three-dimensional stress and progressive failure analysis of ultra thick laminates and experimental validation“, Composite Structures, Vol. 93, No. 5, pp. 1394-1403, 2011. Camanho, P., Arteiro, A., Melro, A., Catalanotti, G., Vogler, M., “Three-dimensional invariant-based failure criteria for fibre-reinforced composites“, International Journal of Solids and Structures, Vol. 55, pp. 92-107, 2015. Matzenmiller, A., Lubliner, J., Taylor, R., “A constitutive model for anisotropic damage in fiber-composites“, Mechanics of materials, Vol. 20, No. 2, pp. 125-152, 1995. Vo, T., Guan, Z., Cantwell, W., Schleyer, G., “Low-impulse blast behaviour of fibre-metal lami“, Composite Structures, Vol. 94, No. 3, pp. 954-965, 2012. Hibbitt, H., Karlsson, B., Sorensen, P., “ABAQUS theory manual, version 6.3“, Pawtucket, Rhode Island, USA, 2006. Puck, A., Schürmann, H., “Failure analysis of FRP laminates by means of physically based phenomenological models“, Composites Science and Technology, Vol. 58, No. 7, pp. 1045-1067, 1998. Liu, P., Zheng, J., “Recent developments on damage modeling and finite element analysis for composite laminates: a review“, Materials & Design, Vol. 31, No. 8, pp. 3825-3834, 2010. Tsai, S. W., Wu, E. M., “A general theory of strength for anisotropic materials“, Journal of composite materials, Vol. 5, No. 1, pp. 58-80, 1971. Hoffman, O., “The brittle strength of orthotropic materials“, Journal of Composite Materials, Vol. 1, No. 2, pp. 200-206, 1967. Yamada, S., Sun, C., “Analysis of laminate strength and its distribution“, Journal of Composite Materials, Vol. 12, No. 3, pp. 275-284, 1978. Spencer, A., “Kinematic constraints, constitutive equations and failure rules for anisotropic materials“, in: Applications of Tensor Functions in Solid Mechanics, Eds., pp. 187-201: Springer, 1987. Camanho, P. P., Dávila, C. G., “Mixed-mode decohesion finite elements for the simulation of delamination in composite materials“, NASA, pp. 1–37, 2002. Mohammadi, B. Kazemi, A. and Ghasemi, R., “Damage analysis of holed composite laminates using continuum damage mechanics”, In Persian, Journal of Science and Technology of Composites, Vol. 2, No. 3, pp. 23-34, 2015. Suemasu, H., Takahashi, H., Ishikawa, T., “On failure mechanisms of composite laminates with an open hole subjected to compressive load“, Composites Science and Technology, Vol. 66, No. 5, pp. 634-641, 2006. Kottner, R., Hynek, R., Kroupa, T., “Identification of parameters of cohesive elements for modeling of adhesively bonded joints of epoxy composites“, Applied and Computational Mechanics, Vol. 7, No. 2, 2013. El-Sisi, A. E.-D. A., El-Emam, H. M., Salim, H. A., Sallam, H. E.-D. M., “Efficient 3D modeling of damage in composite materials“, Journal of Composite Materials, pp. 0021998314525983, 2014. Eng, C. H., “Compressive Failure of Open-Hole Carbon Composite Laminates“, MSc Thesis, Department of Mechanical Engineering, National University of Singapore, Singapore, 2007.